Having attended to the odd raised red galls a few weeks back has lowered my threshold for seeing galls–everywhere I look. And isn’t that one reason to pay attention outdoors? Having NOTICED some often-missed small detail makes that small thing loom large and increases our range of vision. We see what we expect to see, we see what we know, we notice what we have noticed before. Conversely, if we set out expecting to see only some grass and tree trunks on a walk around the park, that’s just what we will see. But once you notice that every tree trunk is covered with lichen, once you notice that each grass has its own host of attendant insects resting among its leaves and flowers. I haven’t searched yet to determine what kind of organism made these galls, but I have more pix of them, perhaps I’ll put another one up so maybe it will help YOU notice this kind of trivia on your next meander outdoors. That’s a pretty magical photo; the title doesn’t do it justice. 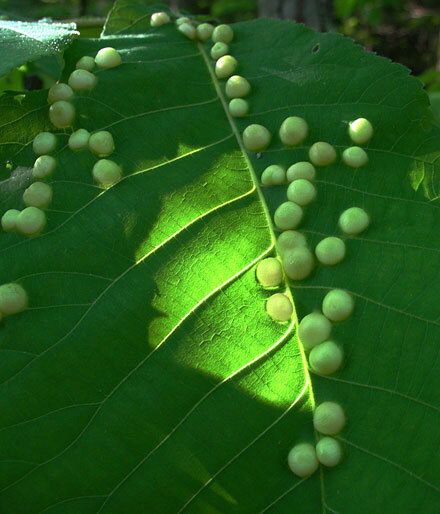 I agree that becoming aware of something increases your notice of it… but I really do think there are more galls this year than normal. Fred, I get the NYTimes headline stories on the Net, and today there was a fascinating plant story saying plants have a secret social life. That they seek out their own kind!